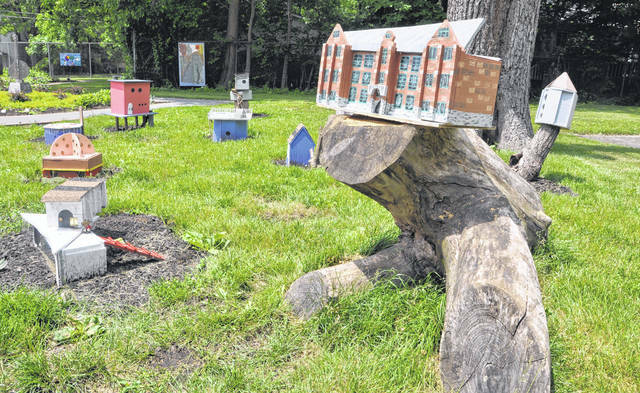 Pictured in this Gazette file photo take in June 2018 is the gnome village located on the grounds of Boardman Arts Park, 154 W. William St. The gnome village was made possible through a grant from the Delaware Arts Festival and through support from Delaware City Schools. The homes were created by Dempsey Middle School eighth-graders with help from Dempsey teacher Melanie Harry. 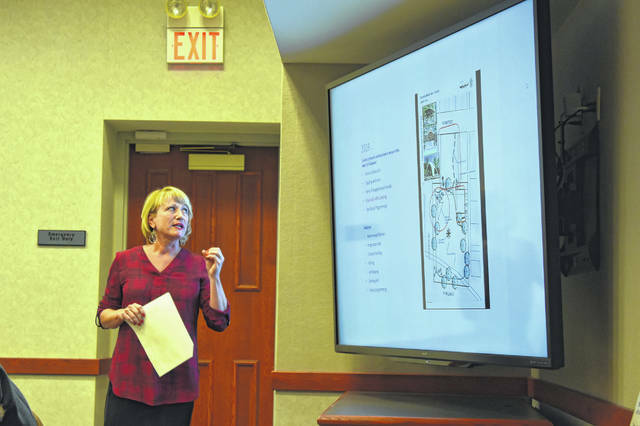 Roxanne Amidon, president of the Northwest Neighborhood Association, gives a presentation about Boardman Arts Park to the joint meeting of Delaware City Council and Delaware City Schools Monday evening. Amidon discussed the events that have been held at the park and described what types of programming the park would like to have in the future. The future of the Boardman Arts Park was discussed during Monday’s joint meeting between Delaware City Council and the Delaware City Schools Board of Education, but no formal decision was reached. Northwest Neighborhood Association (NNA) President Roxanne Amidon gave a presentation to the joint meeting about the arts park and what the NNA hopes to accomplish in the future. The park, located at 154 W. William St., was the former site of Ruth Boardman Elementary School until it was torn down in 1979 and used as an athletic field for students at the then Willis Intermediate School. Since the district transitioned fifth- and sixth-grade students to the elementary schools and Dempsey Middle School, respectively, the park was unused, and the district allowed the NNA to make use of part of the park for events. Amidon said the NNA wants the park to hold more events and to be family-friendly, but also financial sustainable. Amidon outlined the NNA’s wishlist for the park, and she added the NNA wants to add a performance platform to show off art and also hold concerts; have more community gathering spaces; a four-seasons room to allow for activities or events year-round; more parking; landscaping and unique programming. Amidon said the biggest question for the park is the ownership. Delaware City Schools Superintendent Paul Craft said the district does not anticipate “a future educational need” for the park, and the district is looking to get rid of the property because it’s just a liability and a maintenance cost. However, Craft said there’s only two ways for the district to get rid of the property; exchanging it for other land or selling it at public auction. Craft added the district could consider a lease to either the NNA or the city, and the district “believes” in what the NNA is trying to do with the property. “There’s a shared belief in the future of this town and the future of that parcel,” Craft said. “I think they are great ideas. I just don’t know that we want to own it at this time, but I support what you are doing whole-heatedly,” said Mayor Carolyn Kay Riggle. Amidon said the estimated cost of daylighting the run is about $500,000. Council member Lisa Keller said the timing “is really rough,” because the city recently passed a park levy but all the funds from it are spoken for. No consensus was reached during the meeting, and Craft imposed a deadline of May to look into more options for the park. More information about the park can be found at www.delawarenna.org. Amidon was joined at the meeting by several other members of the NNA, many of whom vounteer to maintain the park.